Nobody ever switches the ice beam off. The beam system was planned to be a little more complex than the original Super Metroid stacks. There's a base damage value, that goes up every time you get a new beam, and some modifiers, that are part of each beam's features. In theory, this gives the player many ways of approaching situations. Having Plasma Beam enabled makes the beam hit multiple times, but the damage is lower. Spazer spreads the base damage on each beam, and with some extra damage, you'll need at least 2 beams hitting an enemy for an actual damage boost. It was getting a little painful to balance. On each revision the beam combinations went from really impractical pea shooters to extremely overpowered. And, in all cases, having all 4 beams enabled was the best choice, there was little reason to change combinations. Missiles, in the end, turned out to be just Metroid killers, and nothing else. So, after explaining the system to the test players, they never found a situation to turn any beam off. The game wasn't designed with active switching in mind, like the Prime series. So, I think the best is to make things simple again. Now, beams act like in Super Metroid. If, for some reason, you decide to disable one of the beams, it'll be to add some challenge to the game, just like disabling any other useful item. This makes balancing enemies a lot easier. You enter a new area, enemies take many hits, you might focus on killing just the ones in your way. You find a beam upgrade, enemies are much easier to kill. Simple as that. I might keep one or two of the specific-beam-combination puzzles for certain items, but they won't be essential. Anyway. Besides that, there was a major bug hunt. Seems like variable rounding changed from GM7 to GM8.1, causing some obscure glitches here and there. The contents of the next demo is looking good. As always, comments and suggestions are welcome. Having to enter a sub-screen to switch weapons frequently would be a hassle for a game like Metroid. It's fine for puzzles, but probably not so great for combat. Sounds like a good decision to cut. Can't wait for the next demo! Keep up the good work! Cannot wait for the full game to drop! I guess this shows the value of play testing to find balance issues. Nice to see progress being made on the game, hopefully we'll see a new demo soon. In Super Metroid, I never really turned off any beams either. The whole ability to turn off components was kind of underused in the game. I thought it was fine that way; but it just means that particular feature (toggling abilities) is not much of an asset to gameplay. I was probably one of the very few players who switched beams on and off depending on the situation! I found that giving the Ice beam a slower rate of fire was a nice decision cause it made me think ''do I want a gun that takes time to shoot but FREEZES, or a rapid fire weak one?''. I always had the tendency to switch it off when fighting powerful enemies (the miniboss guardian in particular). In cases where I wanted to run through areas without much trouble, I froze everything that was on my path. Shame to see that the complex beam system will be gone. Ah well. I can see the ingenuity in your idea, but if the test results showed that simplicity is best, I will believe you. You can always add a feature later after the final release. Either way, glad to hear that testing is going well. I look forward to the final product and the next demo when it comes. Here's hoping we get another sector or 2 to toy around with, and that the full game will be not too far behind that! Woot! Good to know how it's progressing... hopefully you will be done soon! Also, how's the progress on the mac version? 2Something from the 1st demo that I liked is that the weakest enemies just die when we shoot with ice beam. On Super Metroid, the weakest enemies get frozen first, thus we need to shoot twice, that was kind of annoying and that's why some players turned the ice beam off sometimes. I just insist that there ought to be little films for when Samus lands, when she surprisingly comes across with chozo ruins and the first alpha metroid (she didn't expect to see them evolving), the Queen, killing the Queen, the baby hatching and leaving SR388 with it. Another suggestion I can give is trophies. Just like the consoles do nowadays, you could put some trophies for us to try to achieve during the game. Keep it up Doc! I check the site almost all the time just to see what's new. I can't wait for you hard work to pay off! I love the innovation you're coming up with for this project, Doc., but yeah, I really think making the beam system simpler was the right thing to do here. Looking forward to this new demo. I'll admit that I never really cared about beam switching in any Metroid other than Prime 1 & 2. 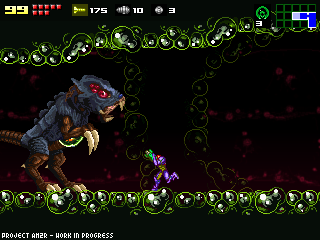 Until Super Metroid Redesign that is. That had a genius system where they locked out beam switching until you got the hidden beam combo item. Each beam had a different use up until then and it made it less irritating to have to go in and switch all the time as opposed to a system where it merely affects rate of fire & damage. You had to use the Wave Beam to open shutters, Ice to freeze, Plasma to defeat otherwise unbeatable enemies, and I guess Spazer was just an upgrade to your regular beam. I'd love it if you'd look into incorporating something like that... but that would be a lot more work. Im happy you are still on it ! I'm guessing the ice beam doesn't add a lot of damage. One of my favorite things about the original Metroid 2 was that you had to choose between the beams, and take all the advantages and disadvantages that go along with it. While I don't think you should have to collect a beam from an item again in order to switch back to it, I did like the challenge of having a pure beam. While a complex system might not be ideal for normal mode, it would be a great unexpected challenge in Hard Mode. Make Beam combination be purely an averaging of the effects, not an addition. So average the damage level between all the beams added, as well as reload times, etc. So Ice beam combo-ed with Plasma beam would be slower reload than Ice beam alone but faster than Plasma alone, but more powerful than the Ice beam and less powerful than the Plasma beam. That way, combining all the beams gets all the special effects, but reload time and power will not be the highest, and hopefully make a noticeable difference. Ice beam or Spazer being the weakest. This is a thing I forget to mention: Samus "normal" beam is too powerfull. It looks like a machine gun, if you stay away from any enemy and tap the button, he will be easily killed. Missiles become just a Metroid killer. I think that anti-beans enemies can solve this, and a poor starting beam, like in Super Metroid go well too. And only in the end, a powerfull plasma beam, just to make easier going back to starting areas. Great work Doc, these details are essential for the gameplay, but not so evident. Suggestion: could you perhaps add the resolution "1280x720"? In particular I'm think of the display actually being 960x720 but then having black bars on the sides. This is useful because some low-end GPUs (like Intel HD4000) don't let you preserve the aspect ratio in fullscreen, so in-game black bars is the only way to not have a stretched game view. Speedrunners will turn Ice Beam off as long as it continues to stack that final "freeze before killing it" hit (so they take fewer hits to take out "in the way" enemies). They'll turn it back on for quicker routes etc. when needing to use enemies as platforms and the like. On a side note, I did enjoy the idea of different rates of fire depending on what beams you had equipped. As for things being unique and giving reason to switch on certain beams and the like; I really liked how charging single beams with power bombs on in Super gave you special and more powerful effects. I wouldn't suggest toying with that this late in the game - especially if you've already done a lot of play testing - but it was one of the points in Super Metroid I liked and was very happy to see something similar in the Prime series with the missile charging. The reason why people turned the Ice Beam off in Super Metroid was due to the fact the beam hit that actually freezes the enemy does no damage. This made it take longer to kill enemies, which is why you see Super Metroid speedrunners turn it off often. Personally, the Ice Beam should not increase damage, it should work similar to the Super Metroid one that essentially just adds the freezing effect at low health. Ultimately, you can typically assume players are going to use Wave, Plasma, and Spazer all the time, so unless you add beam combos, there isn't any real reason to turn those off. Keep up the work! I've been a follower from the beginning and can't wait to play AM2R! For what its worth - I DO turn off the Ice Beam in Super Metroid sometimes. Alot of times it makes farming quickly for health/items easier, only having to fire one shot instead of two. I have nothing constructive to say, as I have no idea where to even begin doing what you are doing. I will say thank you though, because I at least understand how difficult a task it is. In addition, The Ice Beam was the Weakest Beam in the Original Metroid, i usually turn it off. I only tun it on when i have to climb a Way UP or fight "Basic" Metroids. Just to be in the know. Has the thought of quick-switching beams occurred at all to anyone? It could allow for player choice without hindering the gameplay. Make it so that you don't have to go into the pause menu. Samus already has an aiming function so a theoretical interface in which Samus just aims in the direction of the beam she wants would make the transition seamless. That's why it worked well enough in Metroid Prime (at least the Wii version—I never played the Gamecube ones). I really liked the ideas you had for the beams, where each would have plusses and minuses (speed vs. power vs. ability), so it's kind of a shame to go back to Super's simplicity (although I agree with others about why to turn the ice beam off, and wave could make it harder to hit enemies with the spazer, etc., so there were practical reasons for switching). I have one suggestion, something you might try before throwing out the original system. Limit beam combos. Make it so that you can't stack all at once, but maybe only two at a time (charge aside). That would make for 6 different combinations that a player could toy with to suit both the situation and their play style! You couldn't use all of them but you wouldn't be stuck with only one or another. Beam changing sounded great but i also thought, oh great its getting more complicated. But that would have been really neat, though. already we have the option to exchange the beams, you might as well put the extra abilities that we could use in super metroid, like we activated the charge beam and ice and we were with a shield of ice that froze around he touched them, of course we spent a power bomb but it was cool, it would be nice if you put these skills to use in challenges to complete the rate of in-game items. I thank you for the re-make, never played the original, the first I ever played was super metroid and honestly, I found it better than the Fusion and Zero mission, I'm anxious for the new demo, come streamlines there that I'm in a bit crazy from waiting for a good game of metroid. Mas nada que agregar espero que el próximo demo sea brutal.. y sobre los beam creo que tienes razón no eh probado aun el demo ya que no tuve tiempo antes pero supongo que tendrás razón en eso ya que siempre estar con sobre poder no ayuda mucho que digamos y te puedes llegar hasta aburrir.. solo mi humilde opinión :D!! nos vemos en otra actualizacion!!! I loved Other M. So many other games have worse stories and no one pitches a fit. Combat was great and just played great. I just collect it from PIJ. Its really amazing. Does no one know the true power of switching beams on and off in Super Metroid? Hello, has anyone heard of the PB beams. Charge Beam + (any single other beam) + selected Power Bomb = Awesome attacks. Some that help kill bosses like Ridley, Phantoon, Draygon in less then 3 rounds. Switching on and off Beam types was an effective way to play Super Metroid. Insane Mode: Only beam pick up is just before the regular metroids, and it is the ice beam. As to the Ice beam freezing weaker enemies. I actually quite liked that as it helped get things earlier. Anyways, Balancing out the beams would be a good idea. As too often, in remakes/hacks. Beams can be too powerful. I can't wait to see the full release. Are we going to get a AM2R demo after a little while of what the testers did? Aside from challenging ourselves by turning off certain items, would we be able to do other challenges like 15% runs? All I'm saying is Samus is more like the serious type and gives off more like a tomboy vibe. Ultimately I don't care what she becomes since she's a fictional character but it's just dumb to have her be portrayed most of the time as a serious, down-to-business mercenary type of girl and suddenly she gets more "frisky" I guess? I just collect mine at PIJ. Its really awesome. I like the system of progressive beams! will there be a possible option to swap it like that? One possible way to make beam switching necessary: have a maximum of two beams activated at once. Sure, that may force a change of pace in combat situations (PAUSE, submenu, change beams), but dont we do that in Super Metroid already? AND EVEN THEN, in Super Metroid, you can't have all four beams activated at once anyway: The Spazer and Plasma beams conflict. I will say this: I needed to be able to switch High Jump Boots on/off on occasions during Super Metroid, especially through the upper Red Brinstar section. Maybe you should just completely eliminate beam stacking inyour remake. After Metroid Prime was the first metroid game I played, I came to despise beam stacking; maybe you could incorporate some beam combos instead. That way missiles would be used for more than just killing metroids, and it would allow players to at least see what the plasma beam looks like, unlike MZM and metroid fusion. Amazing work dev! Experience just like an official release. Well, keep up the good work. Most game pads have two additional shoulder buttons, so probably those could work for individual beam switching (if you wanted to keep a fluid flow of combat). For beams you could actually play it kind of like Super Metroid's Phantoon fight. In that fight Phantoon would resort to different attack strategies if you used certain beam combos or missiles. I always thought this was one of the best examples of A.I. ever implemented. You could choose to do this with some of your enemies. Why not allow for the ability to switch beams on and off during gameplay by taking advantage of the keyboard? Sake of argument: Q (toggle spazer on/off); W (toggle ice beam on/off); E (toggle wave beam on/off); and R (toggle plasma beam on/off). Pausing the game to select/unselect beams/accessories can continue to exist. Mega Man X for the SNES finally allowed for weapon switching without calling up submenus by using the L and R buttons so there is precedent for this. armor. These are all thoughts and i hope you have as much fun making the game as i am playing it. Does this mean that there will be no elongated cool down between shots? I know it's for balancing and all, but I really found it very annoying, as some enemies will still take more than one shot, but the chance of taking a hit before you can hit them again is brought up by a lot with said cool down.